Miracles are awesome events that cannot be explained by the laws of nature. Jesus Christ did many miracles that helped prove who He is. Many people have heard of the miracles in the Old Testament. The Israelites’ crossing of the Red Sea was an amazing event. Then there are the stories of Daniel in the lions’ den, the three young men in the fiery furnace, Joshua and the walls of Jericho and many other wondrous events. The New Testament tells about many more miracles. The Gospels record more than 30 separate miracles by Jesus. Jesus healed the sick, crippled, blind and deaf. He brought the dead back to life. He cast out demons and did many other miracles, and the people were astonished. Miracles helped people believe that Jesus was the Son of God. His disciples were convinced after seeing some of the wondrous things He did. God also uses miracles to show His power and His love for us. He uses them to increase our faith, answer our prayers and for many other reasons. Jesus’ first recorded miracle was done at a wedding feast in Cana (John 2:1-11). Nearby were six large pots. Jesus told the servants, “Fill those pots with water.” The servants hurried to fill each one to the brim. This miracle caused the disciples to believe Jesus was the Son of God. If you were one of the servants, what would you think when you saw water changed into wine? Would you tell others what had just happened? Jesus and His disciples went around the countryside, teaching the people. A great crowd followed them because they saw Him healing people of their sicknesses (John 6:2-13; Matthew 14:14-21). Jesus and His disciples went up on a mountain and sat down. As Jesus looked up, He saw all the people. He felt sorry for them. The crowd looked tired and hungry, especially the little children. “Send them away so they can go to nearby towns and buy food,” one of the disciples said. They sat down—about 5,000 men, not counting women and children. Jesus took the loaves of bread and the fish and blessed them. The disciples gave the food out to the crowd. Everyone was filled. They were no longer hungry. After taking up the leftover bread and fish, they were surprised. There were still 12 baskets full! How many loaves of bread and fish did the young boy have? Starting with this small amount of food, how many people were fed that day? How many baskets of food were left over? Was this more than they started with? Would you have given your food to Jesus so He could feed the people? Every day the blind beggar sat in a place where many people passed by. He begged for money from them (John 9:1-7). On the Sabbath day, Jesus and His disciples came by. They noticed the blind beggar. They knew he had been blind from birth. It was common knowledge among those who had seen the beggar sitting there for many years. Then Jesus spit on the ground. He reached down and mixed the dirt and spit together, making clay. He spread the clay on the man’s eyes. “Go to the pool of Siloam and wash your eyes,” He told the man. The blind man obeyed Jesus. He hurried to the pool and washed the clay from his eyes. Immediately his eyes were opened. He could see all around. He had never seen the faces of his parents or anyone. He had never seen the sky, sun, moon, birds, animals, plants or trees. Now he could see everything! His neighbors, who knew he was blind from birth, were amazed. “What happened?” they asked. He told them about Jesus and what He had done. They became angry and threw him out of the synagogue. The man said, “Lord, I believe,” and he fell down and worshipped Jesus. He became a follower of Jesus from that day on. How do you think this man felt when he realized he could see? Cover your eyes and see how it feels to not be able to see. Imagine how it would feel to be blind and then suddenly be able to see. 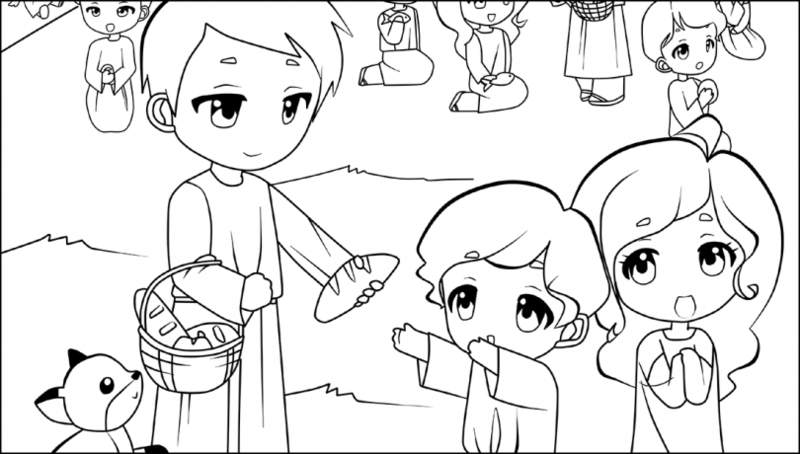 Mary, Martha and their brother Lazarus were close followers of Jesus. He stayed at their home when He was near their town. Lazarus became very sick. The sisters sent someone to Jesus to let Him know. They knew He loved all of them. They may have thought that He would come right away (John 11:1-44). When Jesus received the news, He knew that Lazarus would die. But He also knew He would bring him back to life to show God’s power. By the time they arrived near the town, Lazarus had been dead for four days. Family and friends were gathered around the sad sisters, trying to comfort them. When Martha heard that Jesus was nearby, she went to meet Him. “Lord, if you had been here, my brother would not have died,” she said. Lazarus came out of the tomb! Lazarus was alive again. Many of those who were there and saw this astounding miracle believed in Jesus. A man was raised to life from the dead. How do you think he felt? How do you think his sisters felt when they saw their brother alive again? A lot of people saw this miracle. Do you think this news spread around fast? This was Jesus’ last night with His disciples. After they finished the Passover meal, they left and went to the Mount of Olives (Luke 22:39-51). Jesus knew His death was near and went to a garden to pray. His disciples stayed a short distance away. He knelt down and prayed, feeling deeply distressed because He knew what was about to happen. God sent an angel to help and comfort Him. He got up and returned to the disciples, who were sleeping. He woke them up. As He was speaking to them, a large crowd of people came with swords and clubs. Judas, one of Jesus’ disciples, was leading them. Before the Passover, Judas had met with the chief priests who wanted to harm Jesus. He agreed to help them for money (verses 3-5). The disciples realized what was happening. They stood ready to defend Jesus. Before Jesus answered, one of them drew a sword and cut off the right ear of the servant of the high priest. Immediately, Jesus reached out His hand and touched the servant’s ear, healing him. This was the last miracle Jesus performed just before His death. It showed again that He was the Son of God. As Jesus healed the servant’s ear, what do you think the servant was thinking? If you saw this happen, what would you think? Was this a miracle? Describe what you think a miracle is.